Masses of highly fragrant, bi-coloured blooms appear from July to September adding colour and sweet perfume to the garden. This old-fashioned variety is renowned for its deliciously scented and very beautiful flowers. It was first introduced to Britain in 1700, and it's perfect for training over a wigwam of bamboo canes in a sunny, well-drained site. 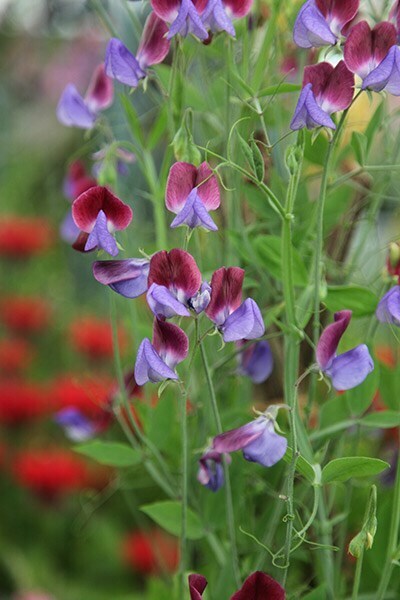 In our (not very scientific) sweet pea trial on the nursery, we found that this variety had loads of very beautiful lilac and mauve flowers in August, but these appeared on short (around 6") stems, so it was not the best for cutting. They did have a very nice scent though. 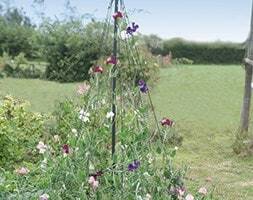 All the sweet-peas in our trial however, produced significantly better plants when the seeds were sown in autumn rather than spring. Garden care: Incorporate lots of well-rotted organic matter in the planting hole. Feed with a high potash fertiliser such as Tomorite to encourage plenty of flowers and keep cutting them so that you get plenty more!